Why Is It Important To Upgrade your device to iOS 8? Home » Mobile Apps » IOS App Development Tutorial » Why Is It Important To Upgrade your device to iOS 8? Upgrade your device to iOS 8 – Apple has announced iOS 8 at company’s Worldwide Developers Conference (WWDC) 2014 on June 2, 2014. This is eight major release of iOS mobile operating system which is designed by Apple Inc.
iOS 8 was officially released on September 17, 2014. According to reports iOS 8 has been installed on 85% of compatible Apple devices. iOS 8 has been quoted as “Biggest change to iOS since introduction of App-Store”. There has been several version of iOS 8 with each version fixing ios 8 bugs. There has been WiFi issue in initial launch of iOS 8 version. This resulted in sudden drop in WiFi connectivity leaving users in lurch. Apple launched subsequent version in short span fixing issue. Lets check with version history of iOS 8. 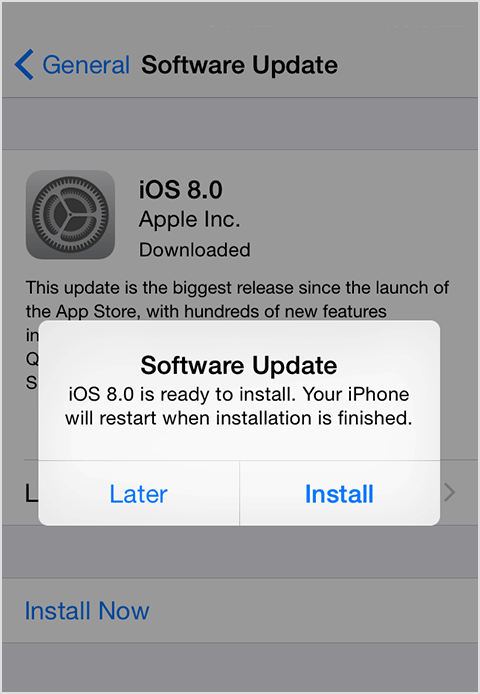 1. iOS 8.0 beta 1 was launched on June 2, 2014 at Worldwide Developers Conference at company’s location, California. It was released for developers. The terminology beta refers to software containing bugs and is bound to have future version with bug fixes. There were several beta versions of iOS 8 for developers. These beta version had bug fixes and enhancements. 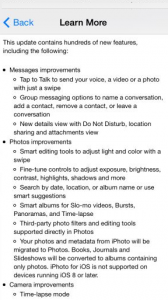 The last beta version for iOS 8.0 was beta 5 released on August 19, 2014. 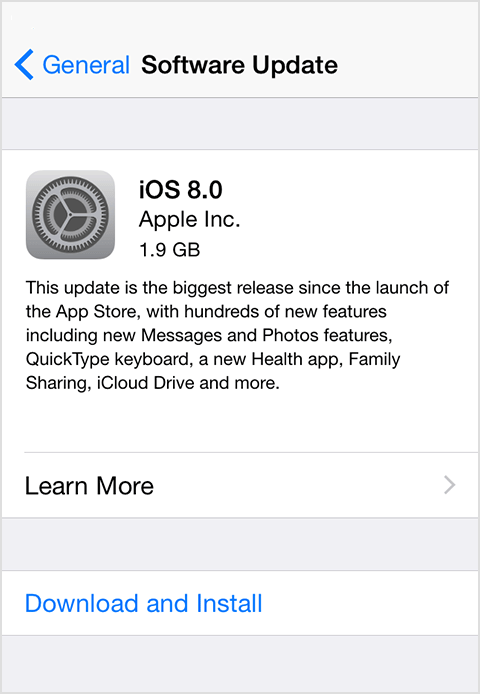 2. iOS 8.1 beta 1 was released on September 29, 2014. This release includes features such as Apple Pay support for iPhone 6 and iPhone 6 Plus, resolves issues with Wi-Fi performance, fixes issues with Safari. It was followed by iOS 8.1 beta 2 release. There has been subversion of this release with each version fixing issues. iOS 8.1.3 was final release launched on January 27, 2015. 3. iOS 8.2 introduces support for Apple watch and some improvement to ioS 8 Health apps. It also increased stability and bug fixes. This was released on March 9, 2015. 5. iOS 8.4 was released on June 30, 2015. This update introduces Apple Music which is revolutionary music service, 24 / 7 global radio. This feature was highlighted in Worldwide Developers Conference (WWDC) 2015 keynote. It also includes improvements for iBooks and bug fixes. If you fall under 25% category of iOS users (iOS 7 and below) then surely upgrade to iOS 8. And to your surprise it is free!! Before upgrading to iOS 8 make sure your device is compatible. You can install iOS 8 in all of above compatible device listed above. However, iPhone 4s, iPhone 5, iPad 2, iPad (3rd generation), iPad (4th generation) and iPad Mini (1st generation) are 32-bit device and soon will become obsolete. Apple has recently forced developers to publish app on App Store build on 64-bit rather than 32-bit. This is because devices introduced after iPhone 5 are 64-bit device. It is always recommended to back up your device to iCloud or iTunes before you update your iPhone, iPad or iPod touch to iOS 8. Before beginning with back up decide with options for back up i.e. iCloud or iTunes. You can make better decision based on feature each of them offers. 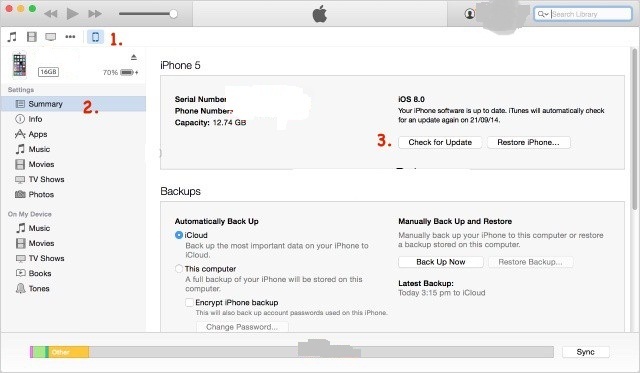 Below are feature for iCloud and iTunes back up. 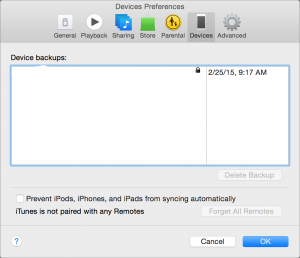 It allows you to store backups on your Mac machine or Personal Computer. The storage size completely depends on space available on your Mac machine or Personal Computer. 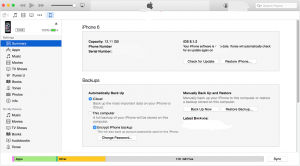 It offers ioS 8 encryption for backups and hence you can store it securely. By default it is Off. You need to enable it to encrypt backups. It allows you to store backups in the cloud i.e. at some secure remote location. The storage size available is up to 1 TB of storage. Note that first 5 GB are free for all apple users. However, if you are in need of additional store then you need to purchase it. The backups taken on iCloud are always encrypted and are secure. 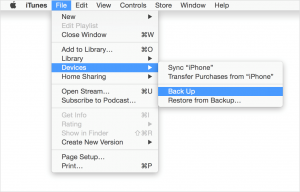 Let’s check how to backup your device using iCloud or iTunes. 1. Open iTunes by clicking on iTunes icon or search for iTunes in spotlight/search menu. 2. Now connect your device (iPhone, iPad or iPod touch) to your computer using data-cable provided with device. 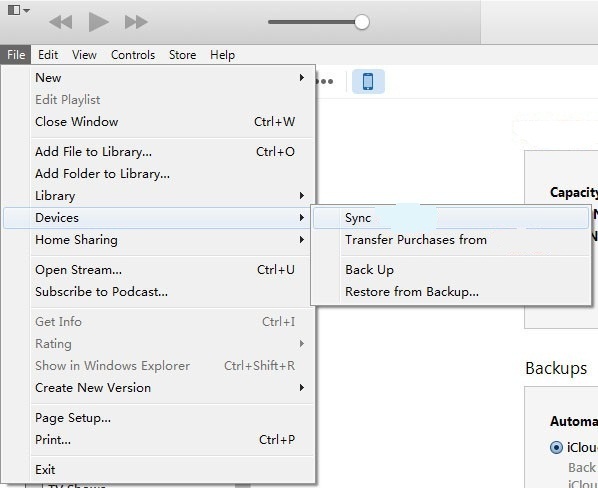 Screenshot 1 shows typical iTunes screen that appear when you connect you device to system. 3. You can save content that you have downloaded from iTunes store or App store. 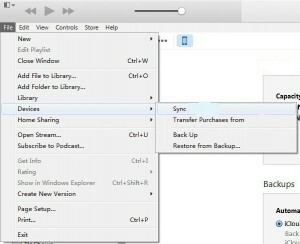 Click on File – > Devices -> Transfer Purchases from “[device-connected]” (shown in screenshot 2). In case you are working on windows system then File menu might not be visible. Press Alt key to make File menu visible. 4. Once you are done with step 3, click on File -> Devices -> Back up (shown in screenshot 3). Note that if you are using windows system then File menu might not be visible. Press Alt key to make File menu visible. 5. 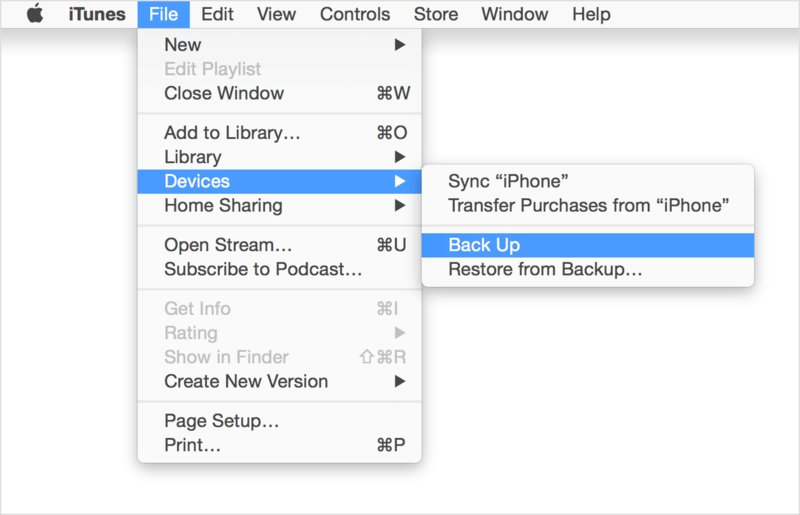 If step 4 is a success then you can see backup of your device by clicking iTunes Preferences -> Device (shown in screenshot 4). 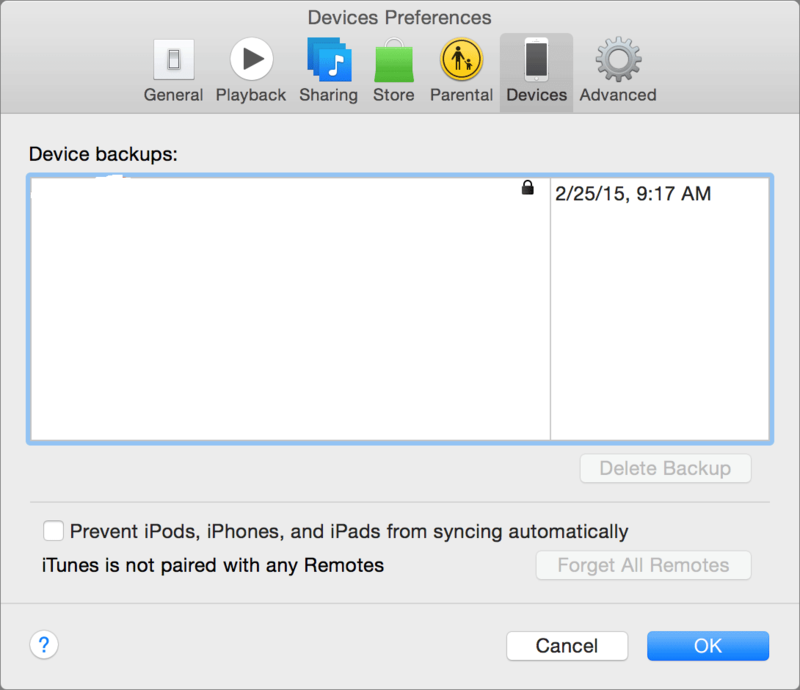 The backup should display your device name along with date and time when backup is taken. 1. Connect your device to Wi-Fi network. While doing this make sure that network signal is good enough to transfer data faster. 3. 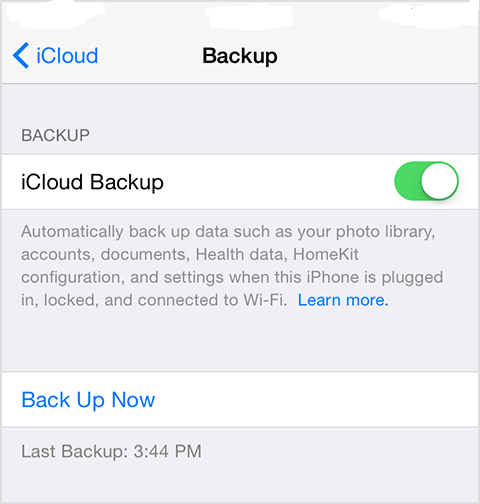 Turn on iCloud backup if it is off (shown in screenshot 5). 4. Click on Back Up Now. Make sure that you are connected to Wi-Fi network until backup process is completed. 5. 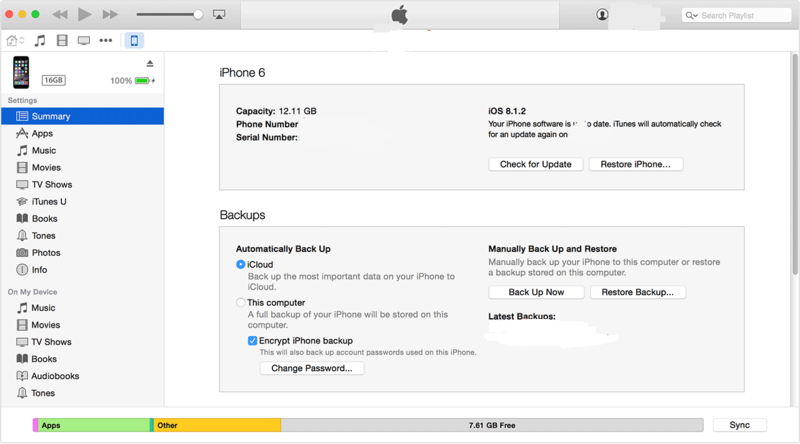 Once step 4 is completed successfully you can check backup by clicking Settings ->iCloud -> Storage -> Manage Storage and then select your device. The backup that you have taken should appear in the details with time and size of backup. Device screen is locked i.e. no activity is performed on device. 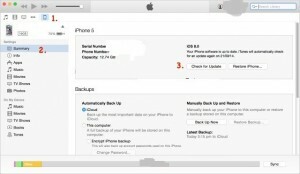 There may be situation that you have taken backup of your iPhone device and are trying to restore backup on iPad device. In such case there are restrictions of data transferred from backup device. You can update device to iOS 8 wirelessly or using iTunes. i. Connect your device to a power source. This is optional method but recommended one since your device may run out of battery while updating thus landing you in great trouble. ii. Select Settings -> General -> Software Update (shown in screenshot 6). 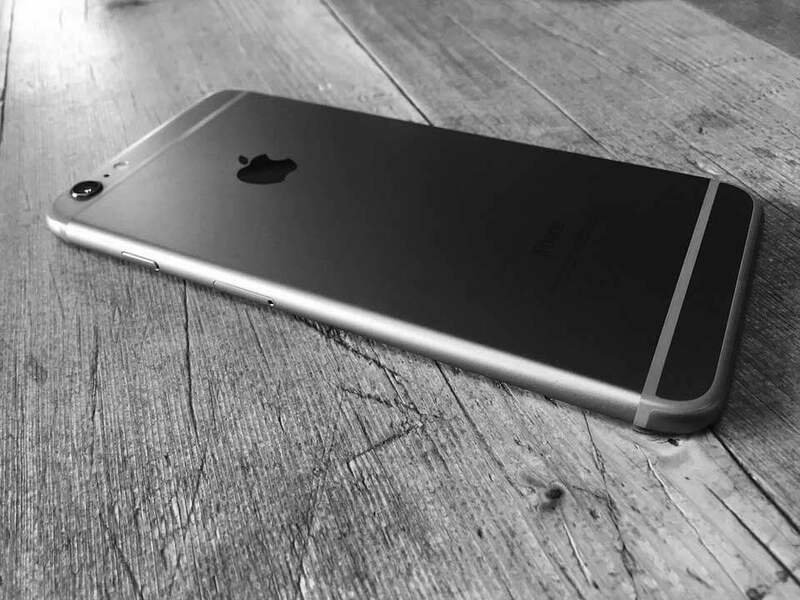 If you want to know more about feature available in iOS 8 then click Learn more. 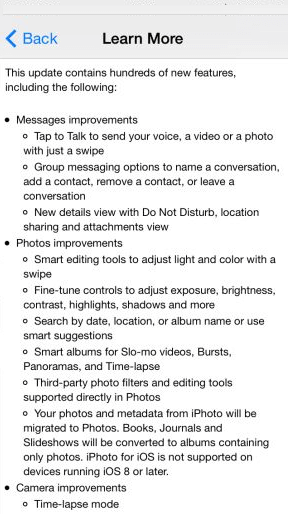 This will push a new view containing detailed description of iOS 8 features (shown in screenshot 7). iii. Click on Download and Install. Updates for iOS 8 will be downloaded automatically while your device is connected to Wi-Fi and power source. iv. This will pop-up an alert for Software Update. Click on Install to install ioS 8 immediately or Later to do it after sometime (shown in screenshot 8). If your device is pass code protected then you’ll be prompted to enter it before proceeding with installation. Before installation note that you have sufficient free disk space available. If disk space required for installation is not available then you can either update your device using iTunes or remove some content from device manually. i. Before updating make sure that iTunes on your computer is latest version. ii. Connect your device to computer using data-cable. iii. Open iTunes and select your device. iv. Open Summary tab. Select Check for Update (shown in screenshot 9). If you are prompted with insufficient disk space available then you have to delete content from device manually from your device.